This documentation covers how Viral Share Actions work. You can choose to add this entry method to your competitions to reward users for referring their friends when entering. When a user unlocks the Viral Share entry method it will generate them a unique link through which all their referrals will get credited. Remember, referrals must enter through the link before the original user gets credited for it. You can limit it until a certain number of actions have already been completed. You can specify how many entries per share a user gets. You can choose to allow sharing via Email, Facebook, Twitter, Tumblr, LinkedIn, Whatsapp & SMS. Mobile Share types will only show on mobile devices (i.e. SMS + Whatsapp). If you have mandatory actions you can show it alongside them (however it's not mandatory that they virally share to enter). Viral Share will auto expand if it is the last entry method left to be completed. You can set a custom body text for sharing via Email/SMS/Whatsapp. You can set a custom share image for Facebook (this does not work for LinkedIn). The Viral Sharing link can only be generated once a user has logged into the widget. 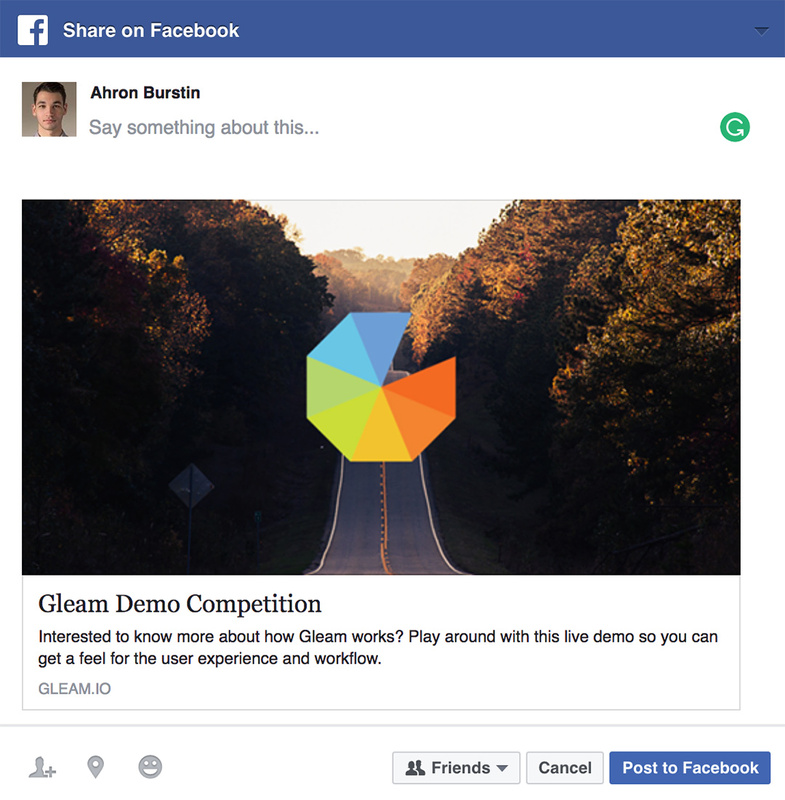 Once logged in they will get generated a unique sharing link that will send people they refer to your landing page. You can shorten the viral links by setting up Bit.ly in your Settings > Integrations otherwise we use our own wn.nr shortdomain. Sometimes you may want to ensure the Viral Share gets automatically expanded so users know to complete it. The Viral Share will always auto expand if it is the last available action to be completed in the contest. Clicking the sharing via email button uses the mailto: parameter to automatically pre-compose an email that your users can send to their friends. This method is preferrable to just entering a list of emails as it comes directly from the entrant & is CAN-SPAM compliant. The default share text gets used as the subject line. You can change the text in the email by editing the Share Body field. Facebook does not allow you to prefill the share text, so in this case we use the default share text as the title and the description from your Prize as the description. When sharing on Tumblr we use the default share text as the title then the users are free to enter whatever they wish in the description field. When sharing on Twitter we will use the default share text as the Tweet, then the URL will get appended on the end. If your landing page is setup for Twitter Cards then you can show them when the Tweet gets posted. 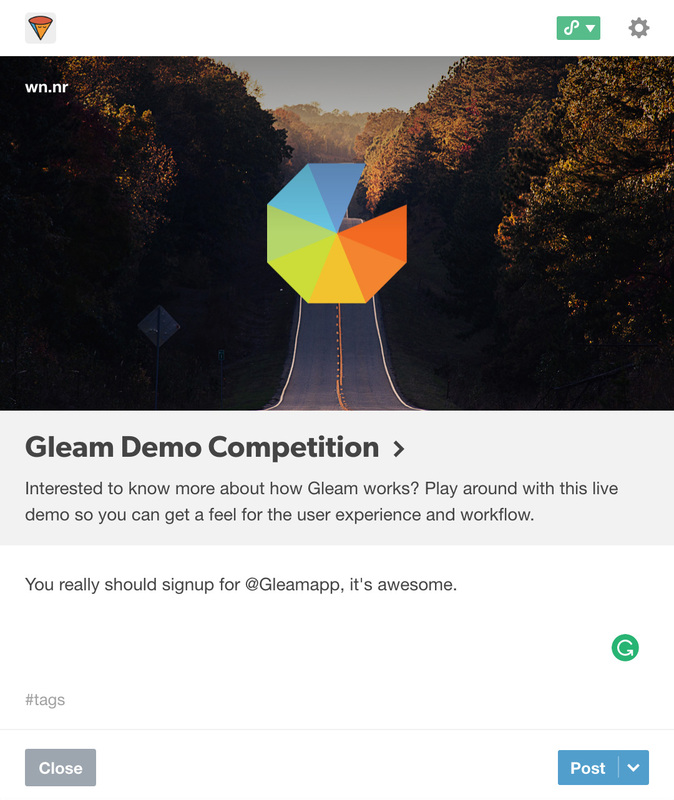 Currently, a user isn't entered into a competition until they complete at least 1 action. 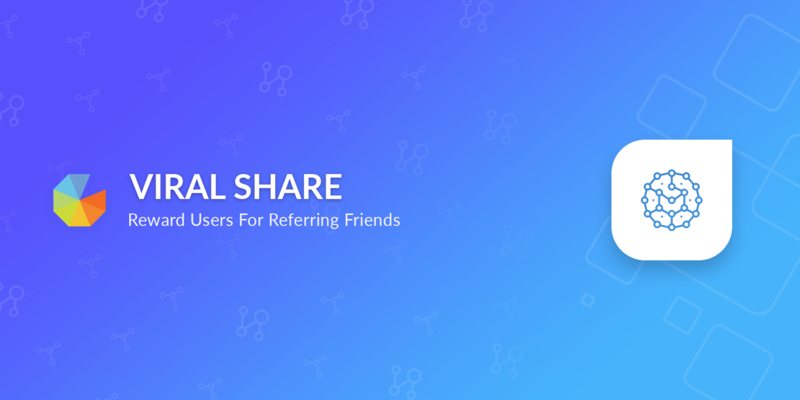 This means if you just included Viral Share only, friends would need to refer friends, who then referred friends to enter. Which isn't very good. The best way to get around this, is to turn on Require Login and also Automatic Entry. This ensures that everyone that logs into your contest gets an entry, which means when they share the entries associated will get awarded. Help I Didn't Get My Entries? This is probably one of the most common questions we get asked. Users will often expect to get their entries for sharing, not understanding that we credit entries when they successfully refer another user. How Do I Change The Facebook Description? The description for the Facebook share text gets pulled from your Prize description which is on the Prize tab when editing your contest. How Come Some Share URL's Are Bit.ly But Some Are Gleam.io? We have a global account with Bit.ly which often hits their rate limits, if that happens we default back to a gleam.io share link. To avoid this you can add your own Bit.ly API key in the Settings > Integrations area which will exclusively use your own Bit.ly account. Please note also, if you generate a Gleam.io share link then you activate Bit.ly it will only generate the new Bit.ly links for new entrants (not existing ones).